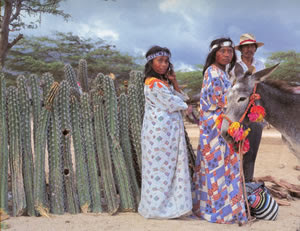 The latest census (1993) shows the Wayuu population to be more than 130.000 inhabitants of whom 68.000 are women and 62.000 men. The population is concentrated in 3,344 Rancherías and the families occupy 23,217 houses. 85.2% of the people are located in the rural area, in rancherías that consist of from one house to more than 400 houses.